Wearing an intriguing and appropriate name, Never Summer Wilderness is tucked among the clouds on the northwestern edge of Rocky Mountain National Park. The 21,000-acre wilderness area bestrides the Continental Divide and receives a healthy dose of snow year-round. 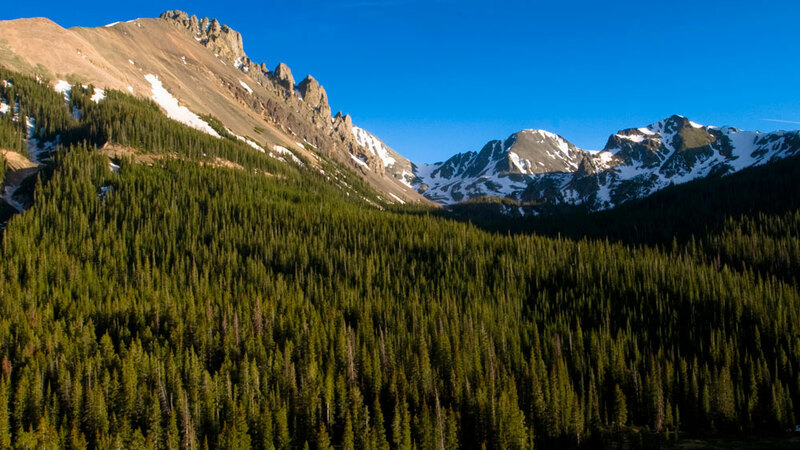 Even in July, the highest peaks wave a wintry hello to visitors at neighboring Arapaho and Routt National Forests and nearby vacation magnets Estes Park and Grand Lake. Hikers can cover a variety of terrain, ranging from 8,900 to 12,520 feet, beginning with gentle forested paths and opening up to steeper, more challenging tundra. Never Summer’s 20 miles of trails stretch up gulches and the Continental Divide on two high passes and deliver stunning, classic Colorado peak-strewn views. Seventeen summits rise above 12,000 feet, with Howard Mountain topping out at 12,810 feet and four of the area’s peaks representing their cloud-friendly locale with names that include Cirrus, Cumulus, Stratus and Nimbus. Because of its secluded storm-catching position, Never Summer Wilderness holds lots of moisture in damp gulches and trees here grow old and fantastically large. Rare high-altitude bogs house wood frogs, pygmy shrew and the occasional moose. Hikers following the Bowen Gulch Trail can witness some of the state’s oldest spruce and fir trees — some thriving at an estimated 600 years and measuring up to four feet in diameter. The trail also offers a peek at Colorado’s mining days when it splits off to an abandoned mining settlement known as Gaskil Site.